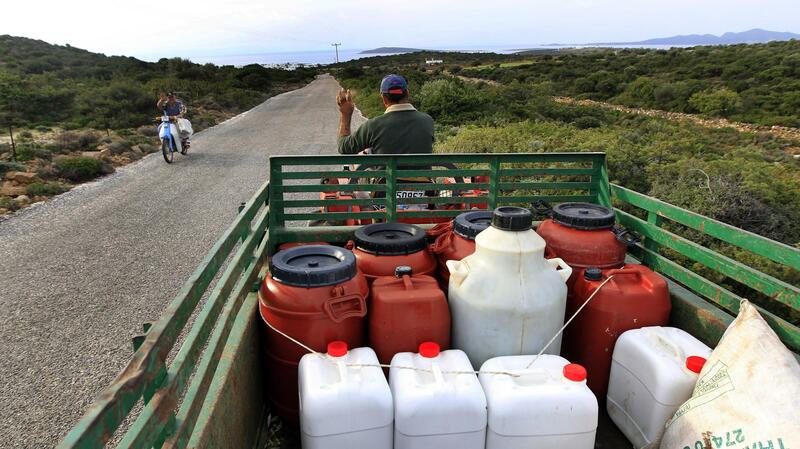 A Greek farmer drives home with his fresh pressed olive oil in barrels near Alyki, Greece. The country's pure olive oil is hard to find, expensive and poorly marketed, businessmen say. Greece is in the fifth year of a painful recession, and it doesn't look like it's going to end anytime soon. One big problem the country faces is a shortage of strong companies that know how to compete on the world market. And nowhere is this more painfully apparent than in the challenges faced by the country's olive oil business. In Greek mythology, the goddess Athena gave the olive tree to the Greeks to win their loyalty. And ever since, they've taken their olive oil very seriously. Greeks say their olive oil is the best in the world. But how do you define Greek? George Eliades is with Peza Union, a food cooperative that sells its own brand of olive oil. "Everybody knows Greek olive oil, and nobody buys it because you cannot find it anywhere. It's very hard to find," he says. For example, the Altis brand is made from Greek olives, but the company isn't Greek; it's owned by the Dutch-British conglomerate Unilever. The same is true of Minerva, which is owned by a British multinational. Together these are the most popular olive oils sold in Greece — they control two-thirds of the consumer market. Although Greece is the third largest olive oil producer in the world, it has never developed any big companies of its own. There are several reasons why Greek companies remain small, and they point to some fundamental problems in the Greek economy. Greek olive oil is more expensive. It tends to be grown on small family farms that still harvest olives by hand. In Spain, Eliades says, olives are harvested by machine. "The machines that are producing 2 tons per hour, the Spanish, they are producing 10 tons per hour," he says. Eliades says Spain and Italy have another cost advantage over companies like his own. They import oil from cheaper producers like Tunisia and Algeria to blend with their own product. He doesn't think Greece is ready to do that. "There is a taboo, that nobody would import olive oil because this is a crime," he says. But the problems go beyond cost. George Kontouris, an Athens food broker, says unlike Italy or Spain, Greece has simply never learned the modern art of marketing itself to consumers. Its products are great, he says, but they have no cachet on the world market. "Made in Greece, for all these years, and especially the last few years, is something that doesn't help you at all," Kontouris says. The upshot is that Greece's farmers grow a lot of olives, but not for olive oil. Some 60 percent of them get sold in bulk to other countries. Farmers earn some money doing that, but in the food business, the real profit comes from making and selling finished products. A recent report from the consulting firm McKinsey & Company noted that Italian companies are in essence making a 50 percent premium on the price of the olive oil they sell, which they make — in part — using Greek olives. "We are working just for the Italians. They take our product and they bottle it with other, cheaper bottles, and they make a very good product which is sold everywhere," says George Eliades. But if Greece is ever to solve its debt problems, its economy has to grow — and the best way to do that is to begin selling more to the outside world. Because Greece has a long tradition of making it, olive oil represents a big opportunity for the country. But before it can realize that opportunity, Greek companies will have to make some big changes in the way they do business. We go to Greece now for a flavorful story. Greece is in its fifth year of recession with no end in sight. And one problem the country faces is a shortage of companies that know how to compete on the world market. NPR's Jim Zarroli traveled to Greece and reports on the challenges for one industry with a long, proud tradition: the olive oil business. JIM ZARROLI, BYLINE: In Greek mythology, the goddess Athena gave the olive tree to the Greeks to win their loyalty. And ever since then, the Greeks have taken their olive oil very seriously. Olive trees blanket the Greek hillsides. People like Katarina Papa(ph), who was coming out of a small market in Salonika last week, say Greek olive oil is the best in the world. KATARINA PAPA: The taste is with a high quality and I use every time this oil. ZARROLI: What brands do you buy? What kind of oil? ZARROLI: Is Altis from Greece? PAPA: Yes, from Greece - I think. ZARROLI: In fact, Altis is made from Greek olives, but the company isn't Greek. It's owned by the Dutch-British conglomerate Unilever. The same is true of Minerva, owned by a British multinational. Together, these are the most popular olive oils sold in Greece, controlling two-thirds of the consumer market. Although Greece is the third biggest olive oil producer in the world, it's never developed any big companies of its own. George Eliades is with Peza Union, a Greek food cooperative that sells its own brand of olive oil. I sat down with him in a cafe in Athens recently. GEORGE ELIADES: I mean, everybody knows Greek olive oil and nobody buys it, because you cannot find it anywhere. It's very hard to find. ZARROLI: There are several reasons why Greek companies remain small, and they point to some fundamental problems in the country's economy. Greek olive oil is more expensive. It tends to be grown on small family farms that still harvest olives by hand. In Spain, Eliades says, olives are harvested by machine, which can pick olives much faster. ELIADES: The machines that are producing two tons per hour. The Spanish, they produce 10 tons per hour. ZARROLI: Eliades says Spain and Italy have another cost advantage over companies like his own. They import oil from cheaper producers, such as Tunisia and Algeria, to blend with their own product. He doesn't think Greece is ready to do that. ELIADES: There is a taboo that nobody would import olive oil in Greece because this is a crime. It's like a crime. ZARROLI: But the problems go beyond cost. George Kontouris, an Athens food broker, says unlike Italy or Spain, Greece has simply never learned the modern art of marketing itself to consumers. Its products are great, he says, but they have no cache on the world market. GEORGE KONTOURIS: Made in Greece, for all these years, and especially the last few years, is something that doesn't help you at all. ZARROLI: The upshot is that Greece's farmers grow a lot of olives, but 60 percent of them get sold in bulk to other countries. Farmers earn some money doing that. But in the food business, the real profit comes from making and selling finished products. A recent report from the McKinsey Company noted that Italian companies are in essence making a 50 percent premium on the price of the olive oil they sell, which they make in part by using Greek olives. ELIADES: We are working just for the Italians. They take our product and they bottle it with other, cheaper olive oils and they make a very good product which is sold everywhere. ZARROLI: But if Greece is ever to solve its debt problems, its economy has to grow and the best way to do that is to begin selling more to the outside world. Because Greece has a long tradition of making it, olive oil represents a big opportunity for the country. But before it can realize that opportunity, Greek companies will have to make some big changes in the way they do business. Jim Zarroli, NPR News. Transcript provided by NPR, Copyright NPR.